Sophia's hair has grown in so quickly, we hardly have known what to do with it. She won't keep her hair ties and bows in it and even if she does her brothers quickly grab them out any chance they get. 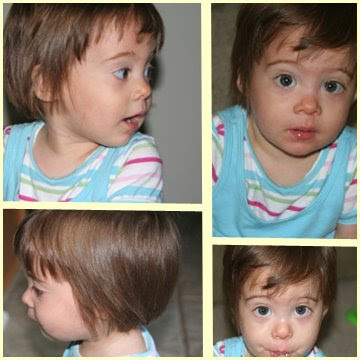 We finally decided to get her a big girl haircut so we can see those big bright eyes of hers all of the time! Can't say she's much of a fan of the beauty shop yet, but I'm sure she'll come around! she looks so Grown up!! so cute! mine are bad about pulling ANYTHING and EVERYTHING out of the girls' hair. stinkers. mari, they are growing WAY WAY WAY to fast!!!! Sophia is adorable... Your posts give me hope to be able to conceive each adn every day!! Are we going to see any Halloween Pictures?? That's absolutely adorable. I love her hair. I bet it's easier to fix now as well. No Halloween photos this year. :( They have all had colds and Finn went to the doctor on Friday where they found a sinus infection and ear infection - yuck! Next year we'll be able to do it up! Speaking of next year, I should get their costumes now while they are on clearance! Aww, Hope they are feeling better!!! Finally -a moment to sit down, and even better to get to see the new haircut. I was hoping you would post pics. She looks adorable! Enjoyed the visit. Much love to everyone, hope Finn is feeling better. The new hair do fits her well. She looks so adorable and sweet. It is REALLY cute! She's adorable. Oh so cute!! I love her new do! And I have to say, I am so glad that I am not the only one that still refers to it as a beauty shop!!! Sophia looks so cute and like such a big girl. Maybe someday our girls will get enough hair to have a cute cut like that too. Adorable pics. Love the new do and love those eyes of hers. Such a trendsetter. 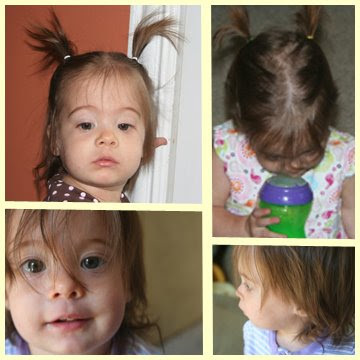 Love her hair..she almost looks like Suri Cruise in one of those pictures to me..Adorable!! Love the haircut! Presious babies and such a beautiful life you have. A friend in East Texas, Pam.